Denver Peace Council says “Science, not war and violence!” | Fight Back! 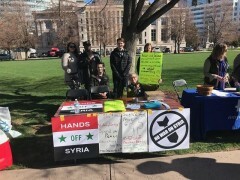 Denver, CO - The Denver Peace Council held a protest against the opening of foreign military bases, April 14, part of a national protest by the U.S Peace Council against foreign military bases. In addition, April 14 was the day of the annual Science March in Denver, a day in which science advocates marched to protest the anti-science actions and policies by U.S. President Donald Trump. The Denver Peace Council joined the marchers in protesting Trump’s anti-science and pro-war policies, especially the recent bombing of Syria by the U.S, England and France. This attack was in direct violation of international law and came just a day before the Organization for the Prohibition of Chemical Weapons was to investigate an alleged chemical attack. Denver Peace Council member Mark Burton said of the attack, “It was an illegal action against the people of Syria. Thankfully the Syrian Arab Army was able to destroy 70% of the missiles.” The Denver Peace Council condemns this blatant violation of international law and urges progressives all around the world to do the same.